Home >>Project News >>HSMAdvisor 1.304 Released! This update fixes the no-message shutdown when your trial expires! Fixed no-message shutdown upon expiration of the trial. 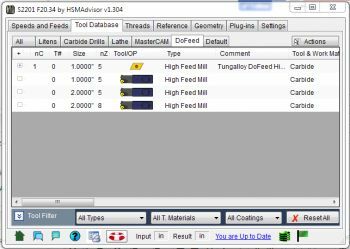 Improved cutting speeds and feeds for milling. Added "Insert" check box and input field to treat Tools as if they were inserts. Added internal "Copy/Paste" functionality to quickly populate custom S&F tables. Added icons to the bottom taskbar. Installer now checks which .NET version you are running and offers to download if it is missing. You can see the new Icons on the bottom taskbar. Feedback: Opens a simple Feedback page to quickly lave a meassage without the need to register. Help: Opens HSMAdvisor Online Help. Also as you can see from the picture some tools can not be specified as "Inserts". They still function as normal tools. You can even specify custom Speeds and Feeds for them. Thank you, everybody for great feedback! New Comment to: HSMAdvisor 1.304 Released!